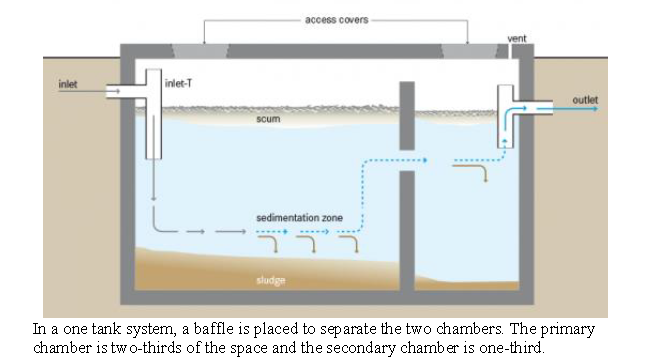 The first tank or chamber holds gross solids, while the second tank or chamber allows sedimentation of some suspended solids before it passes into the leach field. ​Effluent (liquid) flows through the tank and heavy particles sink to the bottom, while scum (mostly oil and grease) floats to the top. Over time, some of the solids that settle to the bottom are degraded anaerobically. However, the rate of accumulation is faster than the rate of decomposition, and the accumulated sludge and scum must be periodically removed. After a short retention time (usually a few days to a week) the resulting effluent is discharged and infiltrates into the ground. Accumulating faecal sludge and scum needs to be removed from the chambers after 7 to 10 years and correctly disposed of by an authorised Liquid Waste contractor. Over time, anaerobic bacteria and microorganisms start to digest the settled sludge anaerobically, transforming it into carbon dioxide (CO2) and methane (CH4 - biogas) and some heat. The gases produced during anaerobic digestion must be allowed to escape. The drainage system of the house has a ventilation pipe at the upper end, allowing gases to escape from the septic tank along the drains and through the vent. 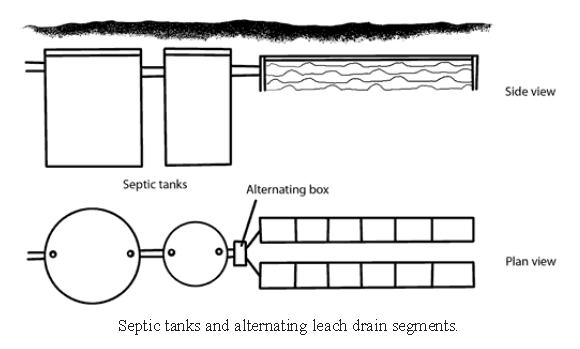 A leach drain is a tube-like structure which is made of concrete or plastic and buried in the ground. There are holes in the sides. Its width can vary and its length depends upon the size of the leach drain being used, the amount of liquid waste to be disposed of, the type of soil (dirt) around it, and how it is built. ​The liquid waste enters the leach drain at one end then slowly seeps down through the open base and out the sides through holes into the surrounding soil. ​Under normal operating conditions, users do not come in contact with the influent or effluent. Many of the problems with septic tank systems arise simply because it is likely to contain large numbers of pathogens, which can be a potential source of infection. Effluent, scum and sludge must be handled with extreme care. Relatively large land area required for tanks and drains. The septic system functions by micro-organism activity and is designed to treat household waste and common substances introduced into the system. For the system to maintain optimum operation please read these notes carefully. ​The following substance can only be introduced into the unit in small to moderate amounts, otherwise it will disrupt the treatment process. For disposal of any oil or cooking fat, soak the oil onto some paper and expel into a rubbish bin. Wipe all oils and fats from all cutlery and kitchenware before cleaning. Diapers and sanitary goods do not decompose in water. Use only toilet paper that disintegrates easily in the water. Do not use tissue paper. The draining of hot tubs and spas into the unit could cause temporary hydraulic overloading and may reduce the efficiency of treatment. Please drain these devices onto another location or release slowly in short bursts and re-plug each time. In general, if a substance is considered harmful to an individual then it should also be considered harmful to the system. The list below displays examples of harmful substances to the system. Do not introduce these items into the treatment system. ​Ideally, to start up a septic tank it should be "seeded" with sludge from a tank that has been operating for some time to ensure that the necessary microorganisms responsible for anaerobic digestionare present. Septic tanks should be checked from time to time to ensure that they are watertight. Routine inspection is also necessary to remove floating debris such as coarse materials and grease, to ensure that there are no blockages at the inlet or outlet and to check whether de-sludging is needed. It is very important to perform proper maintenance and cleaning in order to sustain the unit’s perfect condition. Regular maintenance inspections are to be undertaken in accordance with the wastewater treatment tank regulations. Diverter valve Quarterly. Change the diverter valve to allow water to pass into the other drain. Do this at the start of each season. e.g. first day of spring, summer etc. At worse, change the valve on your birthday. Yearly – check for leaks at lid, growth of vegetation (roots) into tank, scum and sludge levels. Seven to ten years. Sludge pump-out is required if accumulation exceeds the holding capacity. Manufacturer warrants, to the purchaser and subsequent owner during the warranty period, that the mechanical components to be free from defects in material and workmanship under normal use and service, when properly used and maintained for a period of two years. The tanks are guaranteed for a period of 15 years, both periods commencing from the date of purchase by end-users. Parts that inspections determine to be defective in material or workmanship will be repaired, replaced or remanufactured at Manufacturer’s option, provided however, that by doing so we will not be obligated to replace an entire assembly, the entire mechanism or the complete system. No allowance will be made for shipping charges, damages, labour or other charges that may occur due to product failure, repair or replacement. This warranty does not apply to and shall not warrant any material or product that has been disassembled without prior approval from the Manufacturer. 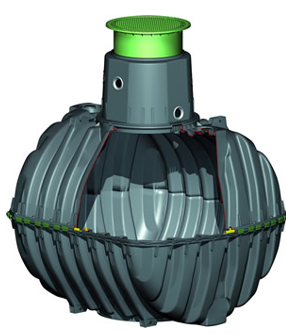 There will be no warranty granted if the tank system has been subjected to misuse, misapplication, neglect, alteration; that has not been installed, operated or maintained in accordance with Manufacturer’s instructions. Water Installations also offers a two year workmanship warranty that relates to all work caried out by its employees or authorised contractors.